In order to prevent thinly potted bowls such as this piece from warping and in order to save space in the kiln, the Ding kilns turned to firing bowls and dishes upside down. Standing on their rims, the pieces could be stacked in a stepped saggar, a ceramic firing container, which also saved the glazes from falling wood ash. The rims, which had to be wiped free of glaze before firing, to avoid adherence to the sagger, were then mounted in copper to hide the rough edge. The rounded bowl has wide open sides with six indents on the outside, corresponding to shallow lobes in the slightly flared rim, and stands on a straight narrow foot. The inside is incised with a lotus scroll with two large blooms, two leaves and two stems of arrow-head, surrounded by foliate scrollwork, with a further, smaller bloom, about to turn into a pod, in the centre. The tool for the engraving was held at an angle to make the design stand out in shallow relief, and details have been added by combing. The outside is plain. 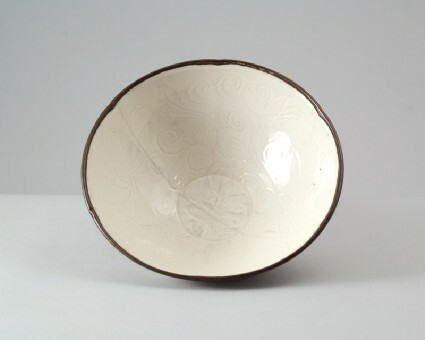 The off-white body bears a transparent ivory-tinged glaze with somewhat darker ‘tears’ on the outside, the footring is partly unglazed, the rim, presumably free of glaze, is bound in a thick copper rim mount.